In October 2010 I listened to Adrian Heathfield and Jonathan Burrows in dialogue as part of Performance Matters at Toynbee Studios in London. They read – or perhaps performed – an email exchange that had occurred between them in the months leading up to the event. A composition must make possible the freedom and dignity of the performer. It should allow both concentration and release. No sound or noise is preferable to any other sound or noise. What I like about these ideas is the overwhelming sense of respect within them: respect for artists, respect for audiences, and respect for the work itself. I’m currently working with Igor Urzelai and Moreno Solinas – igor and moreno – on their latest project A Room For All Our Tomorrows (ARFAOT). 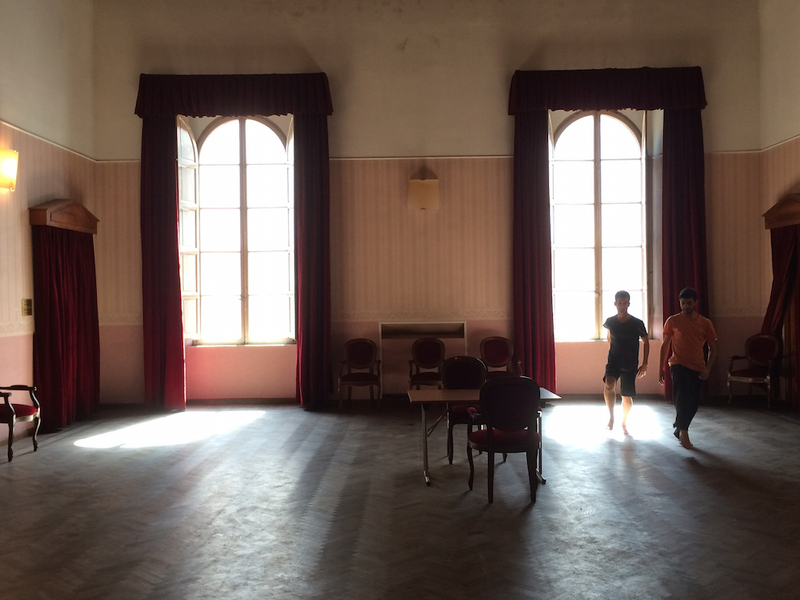 We are working in an upstairs space of an old theatre in Sassari on the island of Sardegna in Italy. I am the dramaturge for the project and as we’ve been working I’ve been trying to understand how I might shape that role so that I am most useful to Igor and Moreno and the work they want to make. In part this involves simply paying attention both to the micro and macroscopic aspects of the work. In other words, what am I seeing in detail, and what is the cumulative affect of these details in how audiences might experience the experience? Then, critically, what are the strategies I might adopt for communicating these ideas to Igor and Moreno, and listening to what seems important to them? In the very first issue of New Theatre Quarterly in 1985 Italian director and author Eugenio Barba wrote about the nature of dramaturgy . It’s beautifully written (and very brief) and in it he attempts to make sense of the complexity and diversity of different actions in shaping the experience of performance and theatre. The simultaneous interweaving of several actions in the performance causes something equivalent to what Eisenstein describes in reference to El Greco’s View of Toledo: that the painter does not reconstruct a real ‘view’, but rather constructs a synthesis of several ‘views’, making a montage of the different sides of a building, even those sides which are hidden from view, showing various elements — drawn from reality independently of each other — in a new artificial relationship. The sense of the weave is important in how Barba understands diverse possibilities for dramaturgical processes. Meanwhile, Igor and Moreno are working on a very particular kind of transition that occurs at what seems to be a critical moment in ARFAOT and I should get back to trying to be useful.